STARS of Intrepid started out as a dream of Xie ‘lanthia and myself, at first it seemed to be a new idea, a resurgence of truth and entertainment post NGE. At first I thought that what it was also, but it isn’t. Xie might believe it is, but that doesn’t matter. It is a dream that’s finally come to fulfillment. It all started way back in the day in Tyrena, back before the there were masters in the galaxy and dreams were still running rampant. Xie and I took the forefront in the group of trying to start an entertainer guild. A guild hall though cost 1 million credits, a sum that was unheard of unless you grouped with other players, and as entertainers a pipe dream. Postponing that we formed Star Dragon Entertainment, I was the representative and comedian of the group, Xie more or less controlled the dancers and organization of the groups. She also named the band. Star Dragon entertainment folded into SCO which became SGO. Some members like NeenaMarie stayed with them until the NGE hit. Later through the band the Def Stars (Original members – En-chi Lada, Chon’wang, Imcus Vree, Xie ‘lanthia, and myself) we increased our fame down to the part that Imcus, Xie and myself became known across the galaxy through different means. Then the IJB was announced, Xie and I wanted to enter – but withthe song we had planned (the AFK Entertainer) we needed 3 people. Chon and En-chi both dropped entertainer and Imcus couldn’t make it. 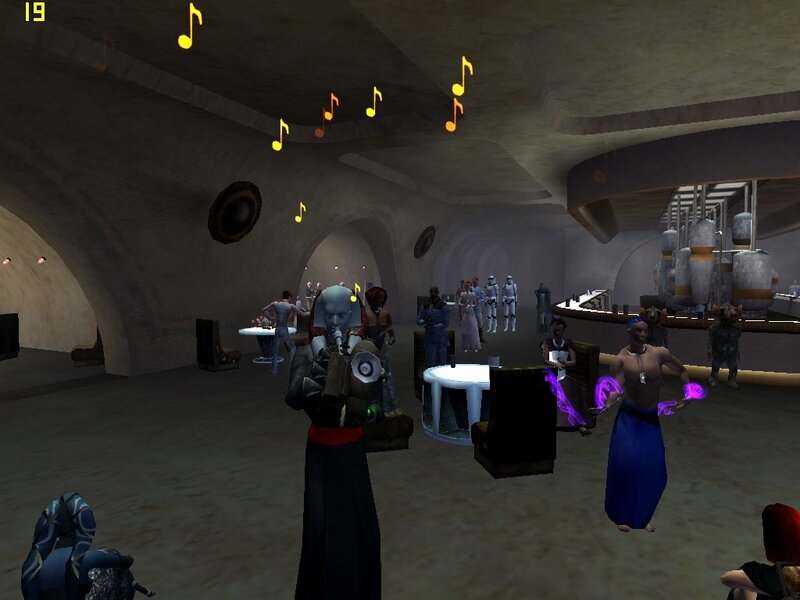 We recruited a long time friend Moya’, we won the IJB and had purchased our guild hall hours before, showing up with Intrepid’s First Entertainer Guild – Guild Tag – DEF – named after the Def Stars and stood for the dedicated entertainer foundation. Since we were slow to guild there was a clique among members and adding new people was slow. This stagnated our growth and our high watermark we required – aka never AFKed – beg for tips, spammed, hurt our growth. We as a group judged instead of retrained. We all did it, we all fought about it, and it stagnated the guild. Xie and I both left DEF when we dropped entertainer because we felt we didn’t deserve the guild tag if we were not entertainers. We tried the combat side and have now come back post NGE and are stronger than ever. When Xie and I agreed to come back, we wanted to perform at funfest- due to respec issues we had to start at the beginning of the entertainer tree – as much as I complained at the time, it was enjoyable to redo it all over again. At this point Xie and I wanted to be in an entertainer guild, but what to do? DEF no longer had any guilded entertainers, and there was no other entertainer guilds on the server. The idea of STARS is born – the irony of being in two major bands STAR dragon entertainment and the Def STARS is not lost on me. I still enjoy standing next to DEF members and getting DEF STARS screenshots. After starting STARS we opened the doors and the good entertainers have started to flock over and we are fulfilling dreams. Theed is becoming lively again, we almost have our new city decorated and ready to open for parties.